Use a panel chunk to highlight content that has a clearly defined header and separate body content. It can be added anywhere on a page, but not in the full position. Separate out contact information or other key messages using a panel at right one-third as a sidebar. 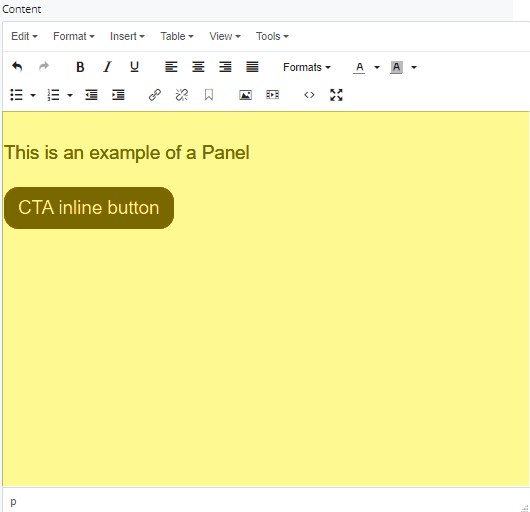 A panel can include a CTA button. If you would like all of the content to be a clickable link, consider using the interactive panel. For more information on the panel chunk, reference the Web Style Guide. This is an example of a panel at right one-third. This is the first example. These panels are in a grid. This panel contains a call to action (CTA) button. This is the text that appears in a larger font size. 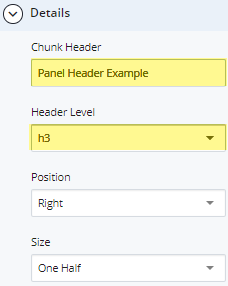 This assigns a numbered hierarchy to your chunk header. The bulk of the text goes in Content. It uses a WYSIWYG editor, and supports styling. Expand to Section > Chunk. In the Type drop-down menu, choose Panel. 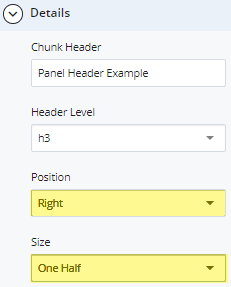 Enter the Chunk Header and Header Level. Select Position and Size. If a grid has been chosen under Section > Details, do not change these fields. Enter content. Styling is supported, and buttons may be added.